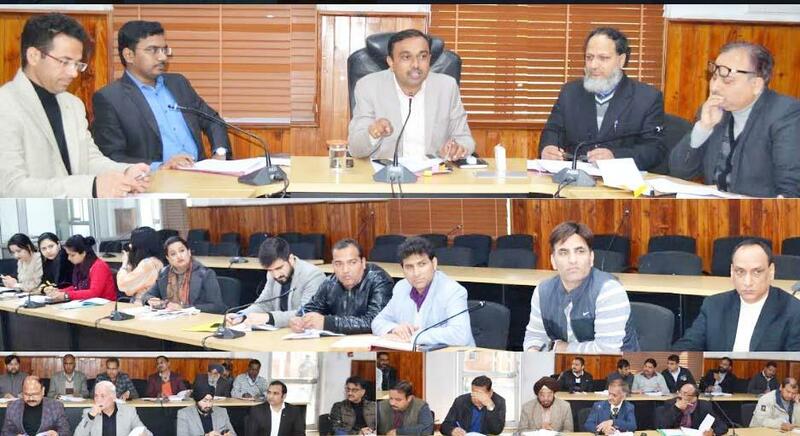 JAMMU, FEBRUARY 09- District Development Commissioner Jammu Ramesh Kumar today chaired a meeting regarding Pradhan Mantri Kisan Samman Nidhi (PM-KISAN) scheme with officers of various departments and discussed modalities for effective implementation of the scheme in Jammu district. Ramesh Kumar discussed various important aspects regarding uploading of beneficiaries data, activation of beneficiaries accounts, preparation of list of exclusive categories, collection of Data, undertaking from beneficiaries regarding PM-KISAN, etc. DDC said that the main objective of launching this scheme is to supplement the financial needs of the farmers in procuring various inputs to ensure proper crop health and appropriate yields, commensurate with the anticipated farm income. He said that the farmers who fall under this category up to 2 hectares shall be provided benefits of Rs-6000 per annum per family payable in three equal installments, every four months. The first installment to eligible beneficiaries during this financial year 2018-19 shall be for the period from 01-12-2018 to 31-03-2019. DDC directed the officers of concerned departments to activate men and machinery and to expedite the process for effective implementation of this scheme at grass root level in the district so that the farmers can avail benefits of this scheme. DDC asked the BDOs/officers to actively involve officials of agriculture and horticulture, patwaris, VLWs, GRS for collection of data /undertaking from beneficiaries regarding 'PM-KISAN'. Later, Ramesh Kumar reviewed status of centrally sponsored development works under MPLAD and sought details of both physical and financial progress of all approved works under the scheme of various departments. He stressed for optimally utilizing the funds for providing better facilities to the people. While reviewing the progress of development works under various departments, he expressed concern over the slow progress of some works by different departments and stressed the need to speed up the pace to complete them all at the earliest. He also reviewed progress of various development works under CDF of MLAs and MLCs. District Development Commissioner also reviewed physical and financial achievements under CAPEX Budget, additionality of 2018-19 of development works. Among others, SE Hydraulic, PDD, Chief Planning Officer, ACD Jammu, XENs and other officers from concerned departments were present in the meeting.